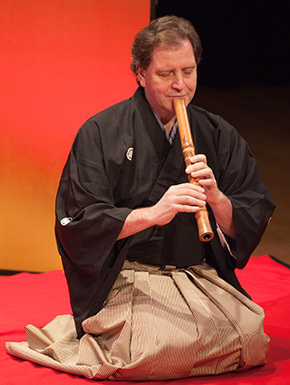 “One of the many things I love about Paul Moravec’s Shakuhachi Concerto is its beautiful lyricism.” And so, shakuhachi soloist James Nyoraku Schlefer sets the scene as he joins the Sybarite5 ensemble on April 15 and 16 for two New York City performances of the concerto. 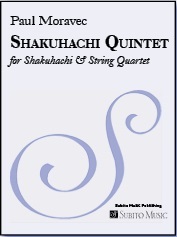 Originally written as a chamber piece for shakuhachi and string quartet, Schlefer commissioned the three-movement, 16-minute work and premiered it with the Colorado String Quartet at the Kennedy Center in April 2012. A month later, the New York premiere followed at the World Financial Center and showcased the Voxare String Quartet, who subsequently recorded the work on the Naxos label. In May 2013, Moravec expanded the piece into a chamber orchestra concerto that premiered in Stratford-upon-Avon (UK) and featured Schlefer performing with the Orchestra of the Swan, conducted by David Curtis. These Sybarite5 concerts present the concerto in its version for soloist and string quintet.